New legislation has been enacted in the UK on the 19th of July, 2018. Though this is UK legislation, and only applies here, it is important because it is one of the first attempts to enshrine the requirements for autonomous vehicles, and electric vehicle charging, into law. The legislation is the “Automated and Electric Vehicles Act 2018,” sponsored by The Secretary of State for Transport, Christopher Grayling. When Does the Law Come Into Effect? This has been widely misreported because of a misunderstanding as to how UK law works. It was brought into law on 19 July 2018, but is what is known as primary, or enabling legislation. In the UK, much legislation is produced at two levels. The primary level legislation is created by an act of Parliament, after being scrutinized and debated as a bill by members of the Houses of Commons and Lords. Primary legislation often does little more than to allow The Secretary of State, in this case The Secretary of State for Transport, Christopher Grayling, to create regulations in accordance with powers defined in the primary legislation. The regulations written by The Secretary of State are referred to as a statutory instrument or as secondary legislation. Obviously, the regulations are not written by The Secretary of State personally, but by civil servants, and lawyers in his department. At this stage, only the enabling legislation has been passed, and there does not appear to be any secondary legislation yet created. Currently, we can only make an educated guess at what the precise details of regulations will be, by looking at the powers given to The Secretary of State in the primary legislation. Until the secondary legislation is created there is no actual law in force to create obligations or prohibitions on any individual or corporation. The law as it stands has no effect, and we have to wait until the secondary legislation is written to make any definitive statements about it. The Automated and Electric Vehicles Bill 2017 is intended to enable and encourage the use of autonomous and ultra low emissions vehicles in the UK. Currently, in the UK, all drivers have to have insurance in order to provide compensation to other parties for personal injury or property damage due to a driving related incident. The Government’s view is that such principles need to be extended to cover automated vehicles, where the car is the driver, and what would have been the ‘driver’ is now (sometimes) a passenger. The intention behind the legislation is to emphasize that if there is a road traffic incident, the compensation for those adversely affected will be paid through the vehicle owner’s motor insurance. There would be no product liability claim against the manufacturer, as has happened in the USA, where autonomous vehicles have been involved in road traffic incidents. The Government intends that ensuring liabilities are met through the vehicle owner’s insurance will give confidence to corporations to introduce their autonomous vehicles to the UK without fear of corporate liability claims for all, and any, traffic incidents involving their vehicles. The measures in the Bill are intended to help deliver the aim that almost every car and van (truck) will be a zero emission vehicle by 2050. (not a very ambitious target date, as this might happen even without any government intervention), Taken together, the proposed powers would allow Government to regulate to improve the consumer experience of electric vehicle charging infrastructure, to ensure provision at key strategic locations like Motorway Service Areas (MSAs), and to require that charge points have ‘smart’ capability. That is the general idea as stated by the government. Part 1, Section 1, defines an autonomous vehicle as one registered as such with The Secretary of State. This ensures that the regulations relating to insurance that we have mentioned, will only apply to autonomous vehicles on the approved list held by the Department of Transport. Section 2 relates to the insurance liabilities that we’ve already spoken about, and ensures that any damages are the liability of the insurer, where the vehicle is insured, or the owner of the vehicle if they have failed to take out insurance. As we have said, that provision is designed to let corporations off the hook for any damages caused by their autonomous vehicles. Section 3 is mainly long and complicated legalese for saying that if the accident was the other person’s fault then the insurer’s, or owner’s liability is limited, proportionally. Section 3, subsection 2 is rather more interesting, because it defines the driver of the vehicle as a separate party from the owner and the insurer, and allows for the incident to be the driver’s fault to the extent that their negligence contributed to the accident. So, for example, in the famous case where the driver was sitting in the passenger seat, when required by the autonomous system to have their hands on the wheel ready to take over at any time, any resulting accident might be partially or entirely their fault. This is complicating the current situation where only the driver is the insured party. A person who is an owner and driver of an autonomous vehicle might need to take out insurance both as an owner and as the driver to cover themselves for all possible liabilities. A person who is in the driving seat, while the autonomous system is the driver, might still require to be insured to protect themselves from liabilities they fall to be responsible for. Section 4 gives insurance companies a get out clause for liabilities caused by the owner or driver failing to maintain the automation software up to date, or making alterations to it. There are more sections, but these are legal technicalities, and probably not of interest to our readers so I omit them. Part 2 of the act relates to electric vehicle charging, and this part has been reported on widely as if the regulations had already been written, when, as I have said, they do not appear yet to have been so. We can therefore only infer what is likely to be the case. This Part starts at Section 9, with rather obvious definitions, such as “a charging point” is where you charge your car, and “a public charging point” is one available to the public: all necessary legal stuff. Section 10 enables The Secretary of State to write regulations which require operators of public charging points to provide specific payment methods, or methods of access to those charging points. Depending on what regulations are actually written this does have the potential to be useful because, as we all know one of the pains to be endured by every electric vehicle driver is to need a suitcase full of cards, and a smart phone full of applications to operate chargers owned by all of the different charging networks. It would be great if, in the UK, at least, all providers were required to use a common access system, preferably a credit or debit card that everyone already has. In my interview with Dale Vince last year, he did suggest that this was coming this year, but there is no sign of it so far. I did invite him or any other spokes-person from Ecotricity to comment about this new Act, but they declined. Section 10 also allows The Secretary of State to write regulations defining standards of performance maintenance, and availability of charging points, and also methods of connection. This would also be welcome, as currently, providers are allowed to be as eccentric as they wish when it comes to maintenance schedules, and what kind of charging and connectors and leads are made available. This could have a big impact on Tesla, for example, which provides public charging points from which all drivers other than Tesla drivers are excluded. Regulations might force them to provide access to all other drivers, and to make suitable connections and charging regimes available. It is also a positive provision under section 10 that providers are required to cooperate with each other and exchange information, so that, for example, where providers wish to make provision at the same site, they might be required to cooperate together to provide an integrated facility. Commercial ring-fencing of information, or access, might also be outlawed under that provision, where all data and access to data has to be opened up. All of this is very welcome because it caters for the needs of electric vehicle drivers, rather than the business models of charging infrastructure and service providers. It all depends on what regulations are actually written. There is no obligation for The Secretary of State to write any regulations, as the primary legislation only allows him to do so, if he wishes. At the moment we have no idea what we will end up with. I contacted Tesla inviting someone to comment on this part of the new legislation, asking if they were aware of it and its implications for its business in the UK, but I have had no response at the time of publication of my article. Section 11 allows The Secretary of State to write regulations requiring the major fuel retailers and motorway service area operators to provide electric vehicle charging points as prescribed by The Secretary of State. 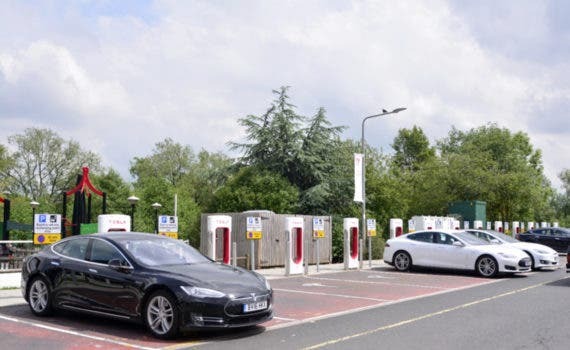 Currently in the UK, we already have charging points provided on motorway service areas by Ecotricity and Nissan, with additional funding from the EU. However, where these are currently provided according to the plans of Ecotricity, they might have to be provided in the future as prescribed by The Secretary of State. For example, The Secretary of State could require any motorway service area to have a minimum number of charging points, and each of those to provide charging connections for all the main types of connector used by vehicles in the UK. He could require that they are all operated by a credit card, and so accessible by all drivers. That would be nice for EV drivers on the motorway, but something of a headache for Ecotricity and Tesla, which currently just do their own thing. As for the fuel retailers, it would be essential to identify where charging stations are actually needed rather than apply some blanket requirement which would waste resources. Charging stations at some larger fueling stations on major roads, or in towns and cities, would be welcome. On motorway service areas, a single charging facility at each one, would be preferable to potentially three different ones, where one is provided by Ecotricity, one by Tesla, and one by whichever fuel retailer provides fuel at the service area. Section 12 places an obligation on The Secretary of State to consider requests by city Mayors for specific regulations to be made in the districts they are responsible for. Under the legal jargon, an obligation to consider is not an obligation to comply with such a request, but The Secretary of State would have to give good reason for declining. Such new regulations would have to be within the scope of the primary legislation, but might be more far-reaching than The Secretary of State himself would wish. This might be a good thing because Tory Secretaries of State are not well known for progressive legislation. On the other hand, the London Mayor Sadiq Khan, a socialist politician, is known for a more radical approach. Section 13 and 14 deals with information and data to be made available to users or other specified people. As an Ecotricity user, I can say that most of this information prescribed in the act is already made available, but it would be a definite step forward that all providers are required to give the same level of information. Section 15 relates to the installation of private chargers, probably intended to be level II chargers, though that is not specified. What is specified is that regulations may require the charger to be a smart charger. A smart charger is under the control of the electricity distribution organization so that it can decide how much power can be made available to the chargers currently in use, and to decide specific times that power will be supplied. This is to avoid excessive demand from car charging at peak periods, and to provide car charging specifically at slack periods such as the early hours of the morning. I have a smart charger at home, and am able to notify the power distribution company, via a smart phone application of any specific time that I need the car to be charged sufficiently for specific journeys to be made. So for example, every Friday I go to my martial arts class 8 miles away in Loughborough at seven o’clock in the evening, and, assuming they know I need to get back as well, they will ensure my car is charged up sufficiently if I have plugged it in. A smart charger also provides two-way communications and data, and I am able to see through the smart phone app just how much electricity I have used for car charging each day and each month. The other sections are again technical sections which simply tighten everything up legally, say how regulations might be enforced, and produced by statutory instruments etc., so I will leave those out. That is all there is currently. There is much potential, but until the Secretary of State produces his Statutory Instrument, the Act is no more than a wish list, and is not actually in force. Having gone to all this trouble to produce an Act of Parliament, at a time when the Government is busy with Brexit, it seems likely the Secretary of State will not be sitting on his hands doing nothing, but the government is good at making statements that sound good as PR but do little or nothing in practice. We shall have to wait and see, which will then be a good opportunity for a “Part-Two” article. There is also likely to be what are called “Transitional Arrangements,” being part of the secondary legislation, which creates some flexibility for compliance for existing facilities, which would otherwise be operating unlawfully from day one. Existing facilities can be made exempt indefinitely, or for a set period to allow a reasonable time to become compliant. All the provisions relating to EV charging points also relate to Hydrogen fueling points, but it is entirely unpredictable what if anything might be specified for that. The value of this right now is that it does throw a pebble into our pool of thought, to get people thinking and talking about it.